It wasn’t long before an N9 bus approached the bus stop outside Charing Cross station, and I got on and headed upstairs. There were a lot of revellers heading home, and some airport workers going to LHR for a an early shift. This ended up being my quickest ever trip, it only lasted about 10 minutes, probably because I fell asleep, only waking up outside the Renaissance Hotel. 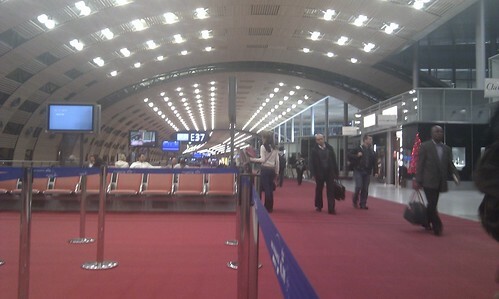 We arrived at the central bus station, and I headed inside, as it was freezing outside, and starting to rain. I had plenty of time until the flight, so I had a wander around Terminal 3, before heading to the Heathrow Express / Connect railway station to get to Terminal 4 (these services offer free transport between the terminals). Our flight was due to board, and did, with mainly business passengers. I’d have thought that most business traffic would use the Eurostar train, unless these were people connecting to long haul flights, and their companies not wanting to shell out for a direct, business class fare. Once on board, we settled ourselves for the short flight. Load was close to full, only one or two empty seats. We pushed back and made our way over to the northern runway for takeoff, with seemingly every other aircraft pushing in front of us in the queue to take off. Eventually we were on our way. We broke through the clouds, to some light turbulence, which lasted almost the whole flight. A service was undertaken, consisting of drinks and a bag of olive breadsticks. The new, modern, minimal style of service. 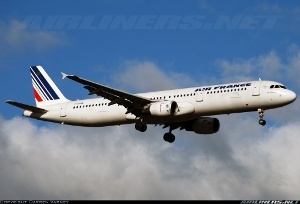 We then stated our descent, and landed without issue, before seemingly taxiing across to 2E satellite. 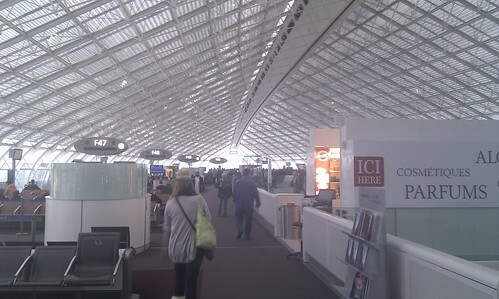 I’d never connected at CDG before, but read some horror stories on here, so I was hoping all went well. Our connecting flight to Abu Dhabi was departing from 2F, so I was gearing myself up for a bus ride, when the signs to 2F directed us down a passageway, and we were then under the next terminal. 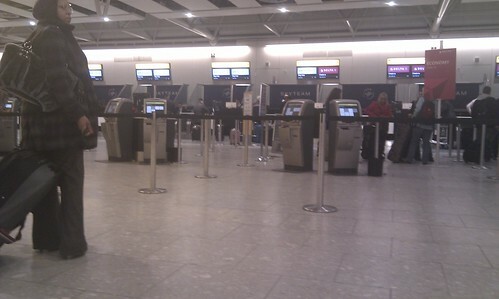 Through security, and we were in a crowded lower level of the departure lounge. 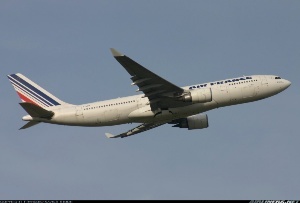 There were even more people on the main level, with a huge crowd gathered round our gate, the next one at the tip of the lounge bound for Montreal, and the Dubai flight opposite. 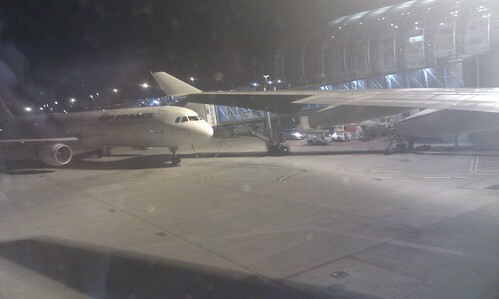 We managed to get on though, and boarded. 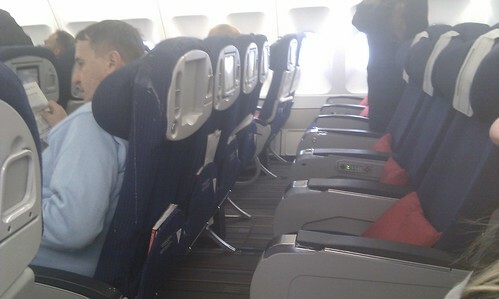 I had picked seats near the back, on the A side, so we had our 2 seats between the window and aisle. We were on board early enough to be able to use the overhead locker above our seats, some people really seemed to bring huge cases on board and this filled up the lockers very early. 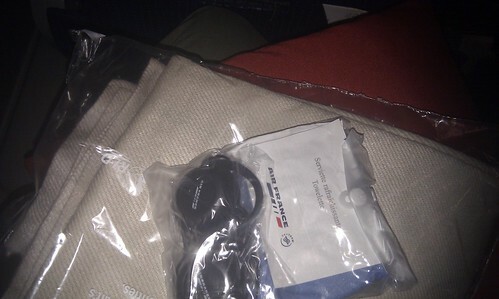 On each seat was a pillow, a blanket, and an amenity kit (yes, Air France still has these in Economy class) which consisted of an eyeshade, ear phones and a refresher towel. Amenity kit, and legroom, combined in one shot! We arrived in the city, and the guy we spoke to earlier pointed us in the direction of our hotel, the Novotel. We thanked him and walked the 500m or so to the hotel, checked in and hit the sack. We missed breakfast the next morning, but had the whole day to sight see. 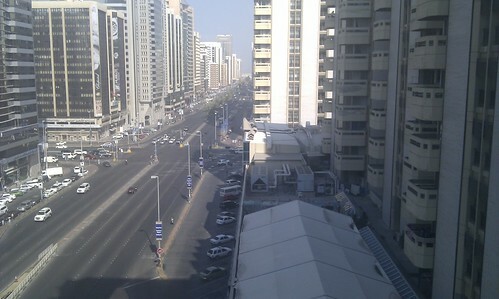 There’s not a whole lot to see in the city, but we headed to the Corniche, for a walk and found a couple of Geocaches. (profile name on geocaching.com: signol) We had a tasty local shwarma for lunch, and plenty of water – man was it hot. We had tea in the food court of a shopping centre nearby, and went to bed early. The next day, Saturday, was the day of qualifying. The paperwork that came with our tickets said that there were 3 park and ride sites: one on the road towards Dubai, one on the outskirts of the city at the national stadium (Sheik Zayed Sports City) and one was at the waterfront Marina Mall. So we went to the mall, no sign of busses for the F1, and on asking someone at the information desk we were advised to go to the stadium – no park and ride here, there was a mistake in the literature. There was a bus from the mall to the stadium (no. 54) so we went that way. On arrival, we saw the P&R signs, and a huge line of busses waiting for people. We headed to the track. 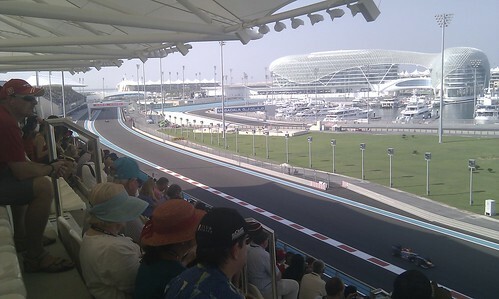 From our seats, we could see almost 1/3 of the whole track, the marina, Yas Hotel and Ferrari World and roller coaster. Video of the view from our seats. Between final practice and qualifying, we had a walk around the stands offering food, drinks (there was a tent selling alcohol, beer at Dh35 (over £6!)) and Etihad promotional material, where you could try out their business class seats. There was also one single tent handing out free water, that was some way between stands, and the water was by then quite warm as it was taken out of the fridges before having a chance to properly cool. We saw the qualifying, and found that the people next to us had also won their tickets, from Air France, from their Ireland Facebook page. The next day, we had to check out of the hotel before going to the race, but they were able to look after our bags. I also bought my wife some pearl jewellery, as this is traditional from the UAE. We went to the race, saw the Etihad A340 flypast, it seemed to be going back and forth over the circuit for about 15 mins! and what a race it was too (Congratulations Vettel!) and then had to get our bags from the hotel before heading back out to the airport. We found the bus stop in the city without any problems, at the Al Ittihad bus station (opposite the British embassy) and weren’t waiting for long before a bus arrived to take us back to the airport. All bags had to be scanned before checkin, I guess this is normal in this region? Or so I’ve read on here. We made it through, and then had plenty of time before our flight. My sister bought some camel milk chocolate, and I some cigarettes for a colleague – they cost less than ¼ of the UK price here. We had an overpriced Costa hot chocolate and cake, and made use of the free wifi on our phones, before “boarding” was called. 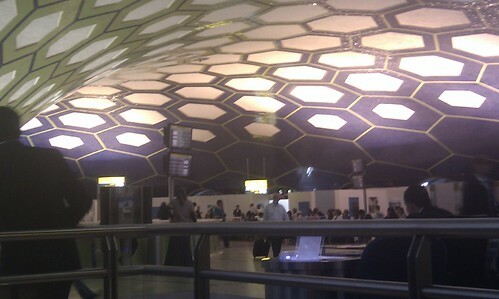 AUH airport. I later saw a “No photography” sign. Oops. 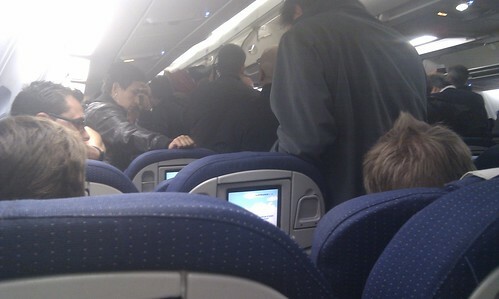 Although boarding in this case meant shepherding everyone into a holding room, before the actual boarding started. There seemed to be some Renault team guys on the place too, about 10 guys in team polo shirts, not looking too happy (but their guy had at least held up Alonso). 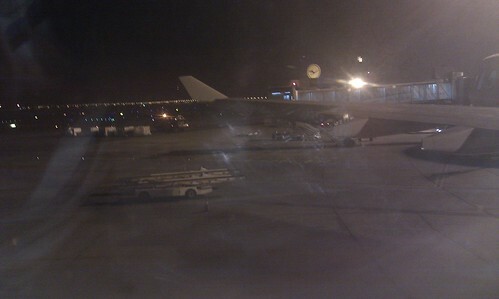 View out of the window, before departure. LH next door. We boarded, and once airborne I fell asleep. There was food, but I can’t remember what it was, or even if it was a snack or meal, sorry. I do remember my sister having champagne with hers though. 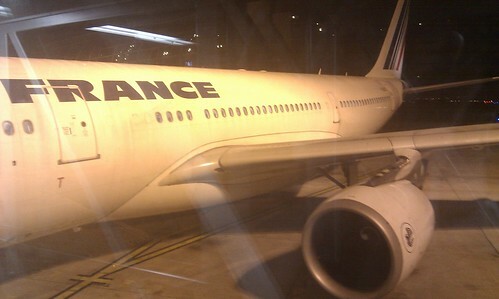 Even though I barely sleep on planes, I woke up near Paris, still in the dark, as we were landing. We docked at 2E, and fortunately our Heathrow flight was also from 2E, so no terminal transfer required this time. 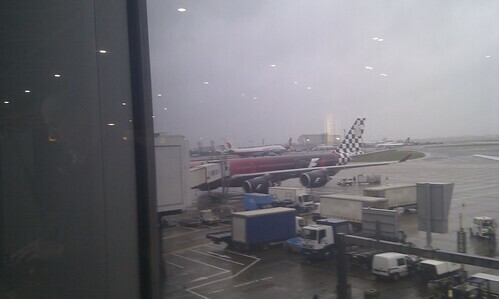 Our plane, viewed from terminal. We passed security and headed to the gate. At the gate, there were two queues, one for business (and first, and status frequent fliers) and one economy. 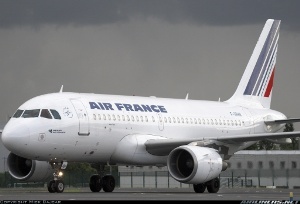 It seemed like ¾ of passengers were in the business queue, and so it transpired – the business section on the A321 was easily 2/3 of the length of the aircraft. 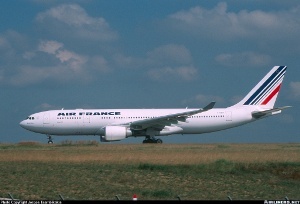 Still dozy, the service on this flight was drinks, and croissant or pain au chocolat. On landing, whilst waiting to disembark, (we were in the last row) I spoke to the 2 crew at the rear galley, about my time working for AF in the language school. They knew it well, though the staff has changed. 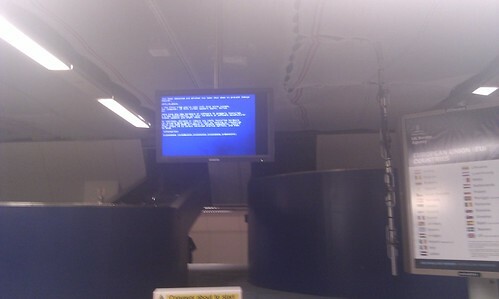 BSOD on the baggage hall screen. We made our way out, found the car park shuttle, made it to my sister’s car, de-iced it (what a contrast) and headed home – she dropped me at my house for a sleep before I went to work a night shift that night, and she went home. Overall remarks, it was a fascinating trip, made better by the fact that it was won. It was just a shame that my wife couldn’t come with me, but these things happen. I now have no flights booked, but the plan is to take my wife (and son) to New York for her birthday in April.